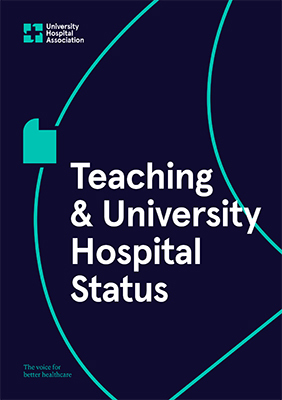 Launching this week, the University Hospital Association (formerly the Association of UK University Hospitals), asserts the importance of education and research in an NHS facing unprecedented pressures. University hospitals offer the most complex specialty care and treat large numbers of patients, requiring significant amounts of skilled staff and funding. Despite tightening budgets and workforce instability, they conduct the research that improves treatment and train the staff that form the future of a capable and adaptive NHS, across every trust. Bob Bell, Chair of the University Hospital Association and Chief Executive of Royal Brompton & Harefield NHS Foundation Trust, said: “University hospitals make up 20% of UK trusts yet account for 35% of all NHS admissions and 37% of turnover. Employing over 330,000 staff, they are large, hardworking institutions and their experience is considerable. “In difficult times it can be necessary for NHS leaders to concentrate on staying afloat, which is when focus can drift away from areas like research and education. But it’s exactly these areas that are the source of change and innovation in the NHS. As their natural home, university hospitals must stand up and make the case for research and education being central to healthcare’s future. The University Hospital Association (UHA) has 44 member trusts. Part of the criteria for gaining the status of ‘university hospital’ is membership of UHA, as established by the Department of Health. The University Hospital Association is the key leadership body across the UK, promoting UK university hospital trusts in their tripartite mission of service, teaching and research. For further information about the work of UHA, see www.universityhospitals.org.uk. Figures on admissions and turnover in university hospitals are from the joint NHS Confederation and AUKUH (now UHA) infographic ‘Little-known facts about university hospitals’. For more information about this press release, contact Edward Knight, Senior Communications Officer, at edward.knight@universityhospitals.org.uk or on 020 7419 5427.